First graders noticed there was a rise in problems at recess and became determined to fix it. 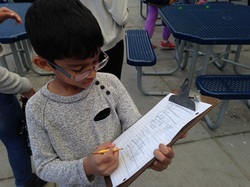 We interviewed students of all ages on our campus and used our math skills to graph and interpret the responses. 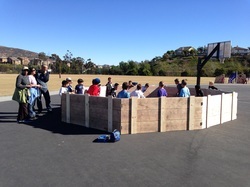 We discovered that many students were bored at recess. Groups split up to ideate and prototype new recess ideas. The Gaga Pit above was one outcome. After reading the book Going Places by Peter and Paul Reynolds, students ideated and prototyped based on an inspiration. Just like the main character, Maya. 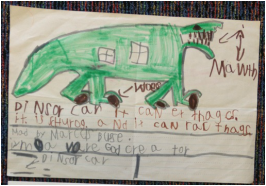 Kindergarteners and first graders also discovered how to name, describe and build 2D and 3D shapes while using them with purpose on their dream cars. We introduce students to the Design Thinking Process on the very first day of school! In order to build early friendships, we buddied up our kiddos and had them go through each step of the Design Thinking Process to design a name tag for their partner's cubby. Empathy, thinking about what someone else likes instead of yourself sure is a challenge at this age! 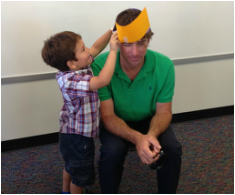 In order to get to know our staff in the Welcome Center at the beginning of the year, kindergartners used the Design Thinking Process to create hats for them. We had to use empathy to discovery what they liked and who they were. We prototyped and tested until the hat was just right. 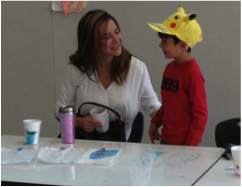 For Mother's Day students practiced empathy as they designed coffee cups for their mothers. Each night children took a prototype home to be critique by mom. Each day students came back were ready to create their next draft. By building revision into the project structure, even those most resistant to changing the design were able to make edits. We discovered that Design39Campus had a huge advertising need...many people wanted to know what we were doing but they all had a different purpose for this information. Fourth and fifth grade students dug deeply into different user groups to analyze what people wanted to know about our school and how they wanted to access this information.